I was at APC for less then a year after being transfered from U. S. Command and General Staff College where I made visual aids. In October 1961 the Berlin Wall crisis happened, and Operation Roundout started. All pictorial junior officers were sent to Europe. The APC CO gave me a present of MOSs 8510, 11 and 12. Motion picture unit CO, director, producer. I think he liked the fact that I insisted on a salute during Saturday inspections. From that date on I was tagged as re-up material. I think there were only three of us with those three MOSs in the Army. Never did re-up though. 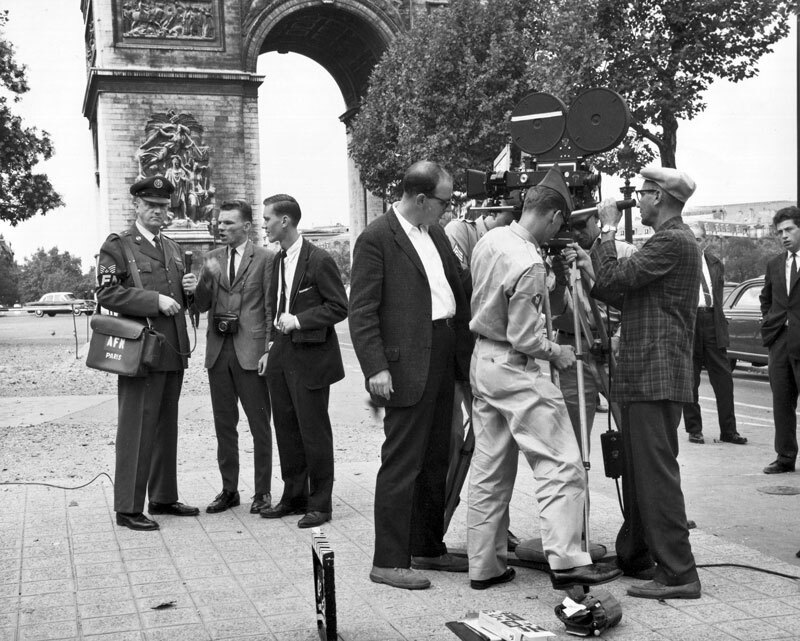 I did work with Harry Franklin in France and Germany in 1962. I became a produer of short films after my tour, won a few awards, too. Then I produced a feature for Paramount. Made 2 cents and I went to law school. Had a ball at the APC. Rented a maid's room at he Sherry Netherlands Hotel (59th and Fifth Avenue) for $50 a month. That was when you could still park on the street in Manhattan. In 1961 the CO of the APC was Lt. Col Robert B. Randle. He was a great guy. He wanted discipline but had an enlisted unit that was composed of mostly artsy-fartsy guys who couldn't salute to save themselves. That group included my childhood friend Steven Segal who was an enlisted man at APC when I arrived. Steve ended up in the publicity departments of Warners and Fox. I arrived from the USACGSC, all gung ho, and insisted on military discipline from the company, me and another newly arrived officer (2nd Lt. Charles R. Grizzle), and Col. Randle loved it. In fact he arranged for "Chuck" and I to have Saturday morning duty (he asked us to, not ordered) just to instill some military bearing into the men. As I'm typing this my memories are flooding back. In checking my 201 file (now I know why I kept this) I see that Col. Randle gave me the following MOSes prior to my leaving for France: 8500 Pictorial Unit Commander, 8511 Motion Picture and TV Director and 8510 which, if I recall, was a staff pictorial MOS. Other officers at APC in 1961 were: Capt. James A Harrington, Capt. James F. Lane, 1st Lt. Victor D. Hunter, 1st Lt. Michael A. Norell, 2nd Lt. Duane Austin, 2nd Lt. James R. Rogers, CWP W-2 Charles R. Lilley. The APC's adjutant was Maj. Sarah M. Benham WAC. When I was transferred to Europe (Operation Roundout) I ended up at 1st Signal Group in Orleans, France, along with about 25 2nd Lts. I was last on the list as we all went in to see Col. McGovern for duty assignments and, bluntly, he needed us like a hole in the head. I watched as Lt. after Lt. was made comm center officer or code officer on the graveyard shifts. I noted that the Group had 15 pictorial detachments and talked McGovern into making me Pictorial Officer EURCOMZ. Had a ball. Even went to the Cannes Film Festival in dress blues!! If you want a few anecdotes, just ask. Harry Franklin?? Oh, boy, and I was in Paris with him. I have pictures from those days. 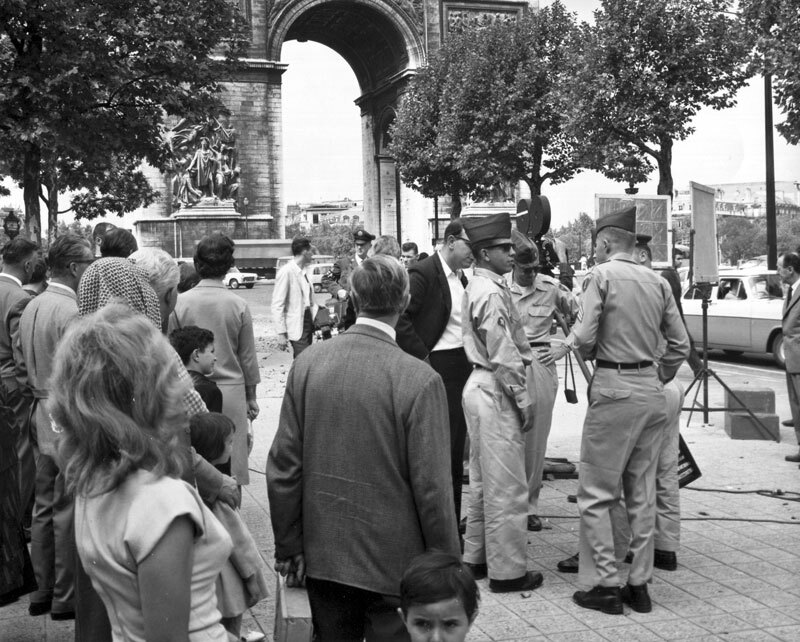 I found a few pictures from 1962 of the filming of a Big Picture in Paris, below. It was the one about US Army Europe Communications Zone. 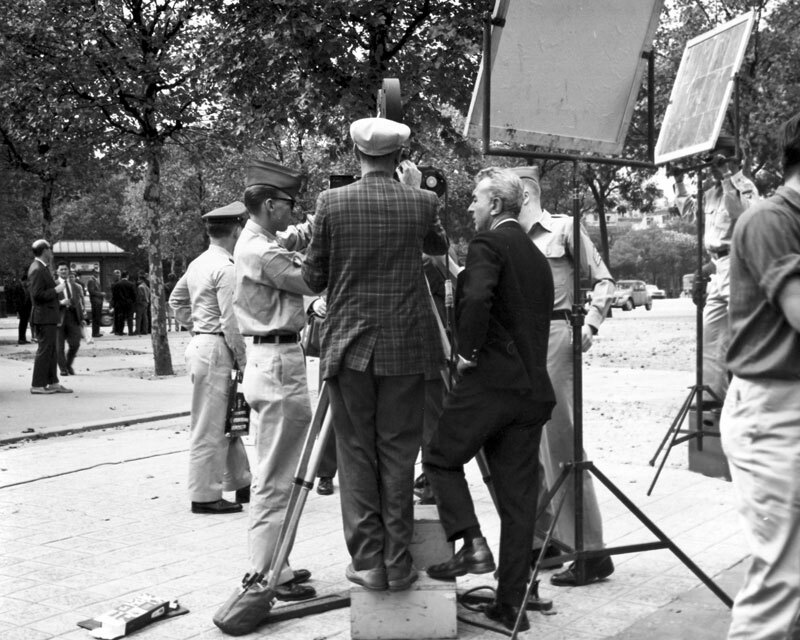 Director was Harry Franklin. I was the Production Officer (1st Lt.) Cameraman was from APC. Crew was from 69th Signal Company (Photo) in Germany. "Thanks for listing me and my memories," wrote Robert Rosenthal. "I read part of Arthur Laurents book "Original Story" over the weekend and he was stationed at APC in the early 1940s along with George Cukor. He relates his times there on pages 22 to 33. You might want to take a look as he names a few equally well known writers and directors who were there. He includes a story about telling off a captain who had been a prop man at MGM. Worth reading the bits just for the story. Perhaps you could post the excerpt." 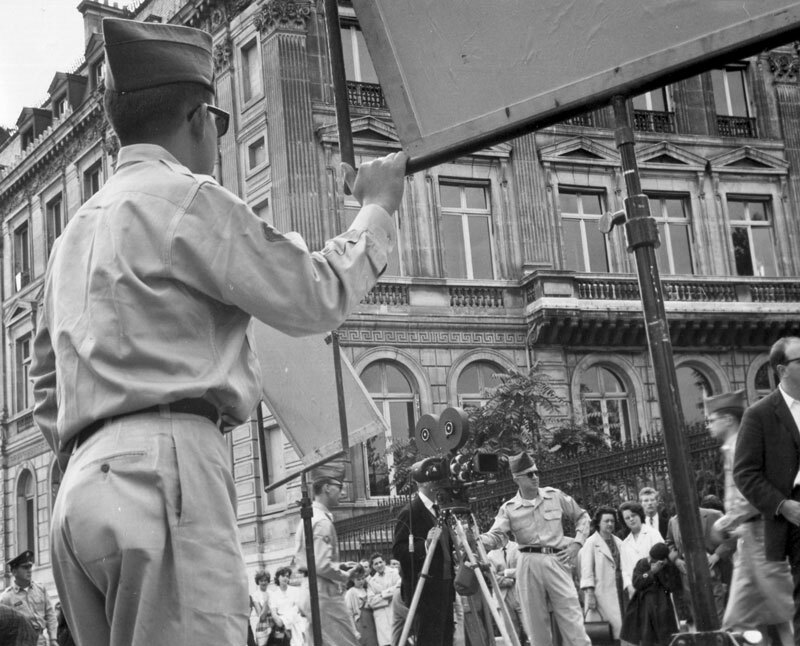 About Laurents' book, the Book of the Month wrote, "He takes us into his days in the Army as a sergeant (in Astoria, Queens), writing training films with Irwin Shaw, William Saroyan, John Cheever, sunbathing with Bill Holden and competing to see which of them could outdrink the other."